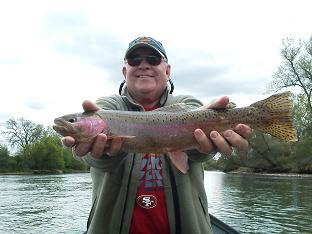 Hook’em Hecky’s is the premier professional fishing guide service for the Trinity and Sacramento Rivers. 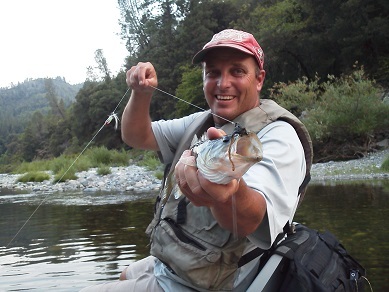 Years of experience stand behind each personal guided trip. 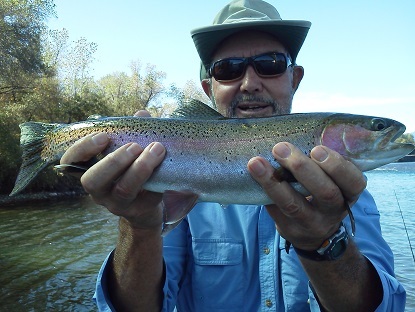 Whether you are looking for a professional fly fishing lesson or are a seasoned fisherman yourself seeking the ultimate thrill of landing a giant wild rainbow trout, steelhead or Salmon. Hook’em Hecky’s is the service that you need. 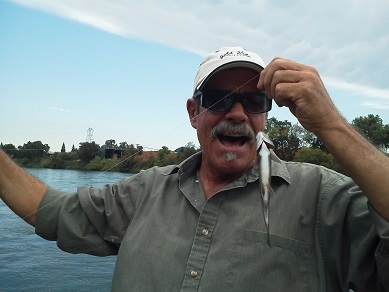 A native of Shasta County, Greg Hector has been fishing the Sacramento River and the Trinity River waters since he was a boy. 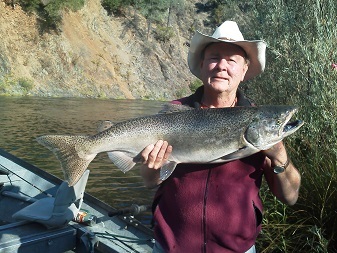 Through his experience and extensive knowledge you too can experience the fantastic fishing Northern California has to offer. 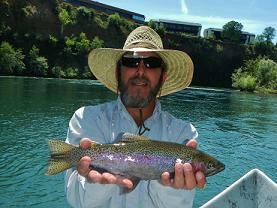 All Guided trips include fishing rod and real, flies, and lures for Summer Salmon trips. 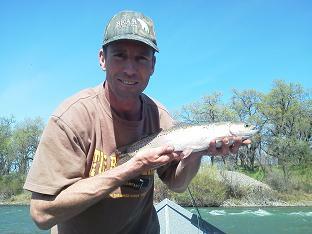 Lunch is provided for full day fishing trips. Half day trips include all gear, soft drinks and water only. Of course if you prefer to use your own gear, you are more than welcome to bring it. If you have any questions, Greg will happily answer them. 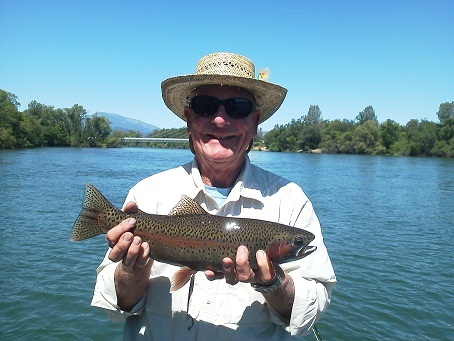 For either a novice, experienced Fly Fisherman or conventional Salmon fisherman, a Guided Outfitter is your best option for an enjoyable fishing trip. Greg, your Hook’em Hecky’s guide, will put every effort out to make sure your experience will be one to remember. 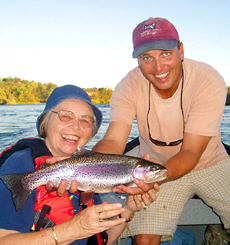 Fishing is a great family sport – bring your family closer together. Beginners and kids are always welcome. 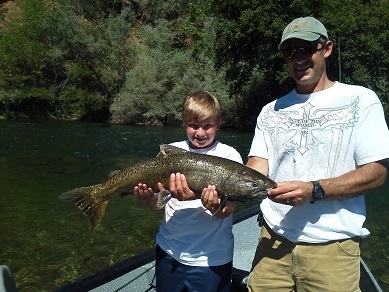 We will help you catch your first fish or your 5,000th fish, and make family memories that will last a lifetime. 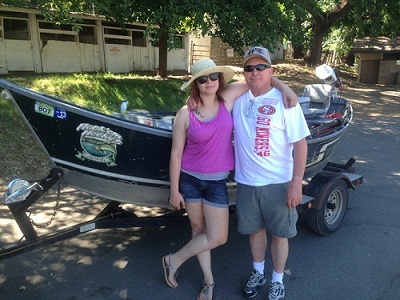 We strive to have patience and to make this a fun experience for kids, adults and beginners. We once all were beginners, and most remember the frustrating points in the learning curve. 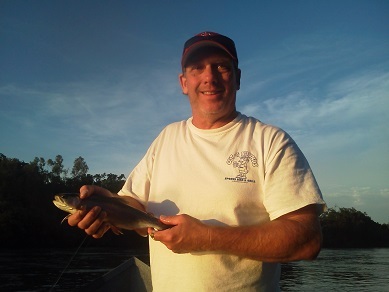 Greg Hector, your Hookem Hecky’s Guide thru his extensive knowledge will break down the fundamentals to make your learning curve more enjoyable. 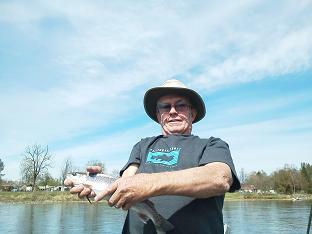 You will always have patience and dedication on your fishing adventure. 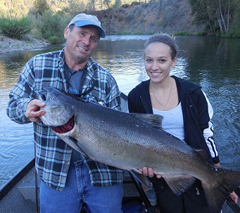 Although not all your catches will be as big as the fish pictured on the right or left, you’re sure to have a great experience. 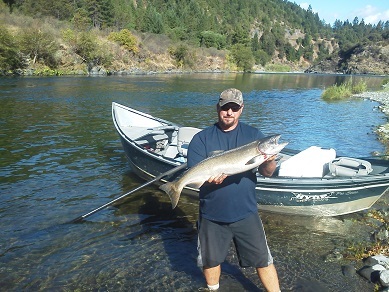 Greg’s knowledge of Fly Fishing as well as Conventional Fishing, not to mention his quality gear and his 2015, 18×60 fully loaded Willie Driftboat, or his 14 Foot Maravia Stream Tech Raft, will provide you the guided fishing service you deserve. 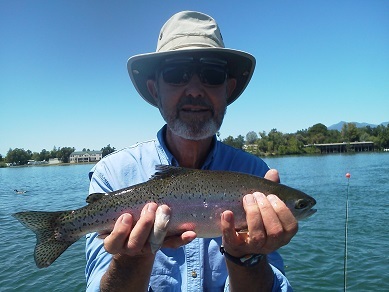 If you haven’t experienced the thrill of hooking a wild Rainbow trout or a Large King Salmon out either of these two world class rivers, you’ll be happy to spend a day with Greg Hector. 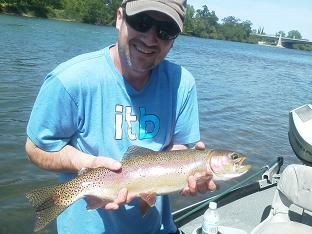 From the novice or the experienced angler to where the fish are and what they are eating. 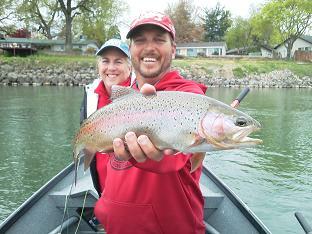 Greg has the patience and experience for a fun filled day on the Water. 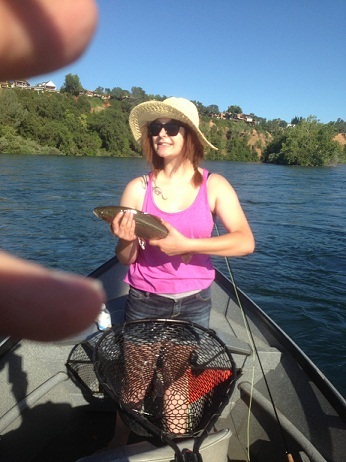 Make a reservation today and put your special day on the Calendar to go fishing with Hookem Hecky’s. 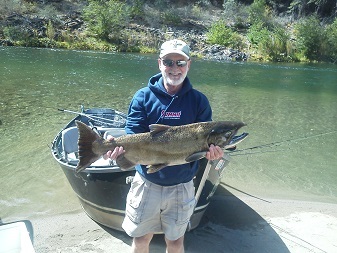 Hookemheckys works with a network of 10+ Guides, which means we can handle groups of 20 or more. 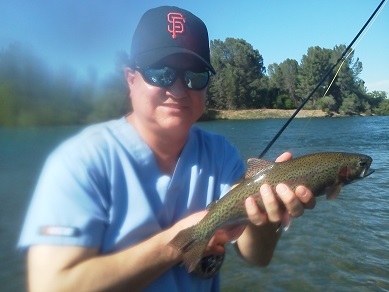 We will host your trip to help with accomodations, meals, car rentals and anything else to make your Guided Float more enjoyable and worry free. We are set up for Credit Card and other payment methods for accountability and tax purposes. 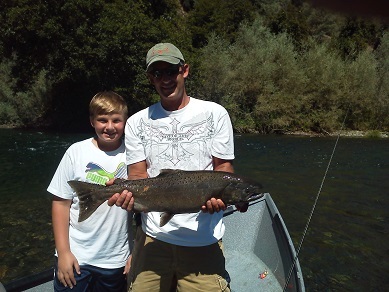 Hookem Hecky and His Mom Rainbow Trout near Sundial Bridge Fly Fishing the Sacramento Trinity River Salmon Fishing Fishing is Family Fun Rainbow Trout Trout Fishing Sacramento River Fishing Trips Family Fun Trinity River Salmon Fishing Take Your Son Fishing They Can’t ALL be Whoppers!